Nativity paper model to cut out and assemble: re-issue, glossy, card stock, 7 sheets, 10 x 10.5 x 6 inches. A beautiful addition to your Christmas decor — on the tree or off — the Theater Papierkrippe. The paper model cover shows theBoy Shepherdpiecein front of theMagi…. 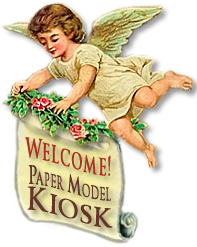 Paper nativities that you cut out and assemble don't get any better thanthis re-issue of a German publisher J. F. Schreiber classic paper model.. The Theater Krippe, as its name implies, unfolds on a stage, behind a proscenium decorated with a Greek pediment and featuring an eight-pointed star and red curtains. Below the stage, at the front, an angelic orchestra is serenading the Newborn Child with voice, recorder, and violin. 1. Glory to God in the Highest:These words are missing from the banner held aloft by two putti, perhaps on purpose, allowing the insertion of the Good News in any language. Below, a shepherd and his sheep behold The Nativity. 2. The Magi:The Kings of the East — in red flowing robes trimmed with gold; in flowing golden beard, and oriental turban — kneel in adoration, their gifts piled high in front of them. Above, the star of Bethlehem has come to rest over the Christ Child. But we chose to place it behind the Magi, so that the foliage to its left does not obscure the Three Kings. What will you do? 3. The Shepherd Boy:In bright red, hands thrown upwards, a young shepherd rejoices at the sight of The Nativity. 4. The Nativity:Wooden beams, a loft filled with straw, and a stone archway and niche decorate the manger. Center stage, so to speak,surrounded by Mary, Joseph, and the shepherds,is the Baby whose gold halo lights up the scene, . Follow the step-by-step diagrams for easy assembly. The rich visual complexity of the Theater Krippe doesn't also mean difficulty in its assembly. The Krippe's large size (10 x 10.5 x 6 inches) means easy assembly, even for little hands, making it a fun project for the whole family. As shown at left, planes 1 - 4are attached to the stage and held in perfect vertical order by tab 7. The proscenium pediment (pieces 15 and 16) is as adventuresome as this construction gets, but Spencer says if he and Ryan could do it, so can you! Magi in front of Shepherd Boy? There's only variation that we — and you — may wish to consider when making the Theater Krippe. 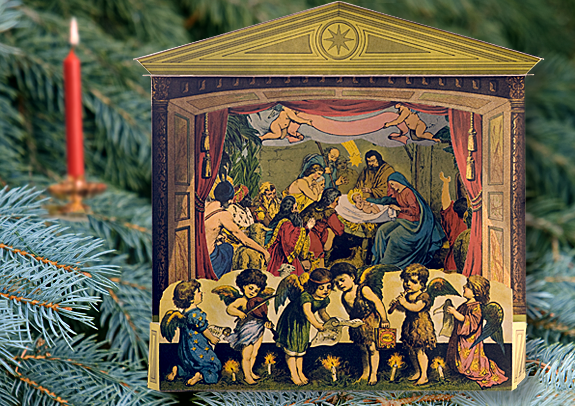 Do you place the Magi behind the Shepherd Boy — as shown on the Theater Krippe cover (above), or vise versa? We chose the latter, because all the foliage at the left of the Shepherd Boy piece, in our mind at least, obscures too much of the Magi. Either way, you'll assemble a beautiful nativity you'll enjoy year after year. Size: 10.24 x 10.63 x 6.3 inches.